Silver Arrow Knits! : Happy Day! This has been a very interesting day indeed. I spent the day returning yarn (yes, I know, an unspeakable idea) but I realized that the yarn I needed for the alien scarf was supposed to be worsted weight and not DK weight and if I was going to use DK weight I would need more yarn. Anyway, I got to The Fabric Place, returned the yarn, and decided that I just wasn't interested in knitting the scarf double stranded and I didn't see any other green worsted weight yarn that I liked. I proceeded to leave the store WITHOUT yarn. It was an amazing feat. At this point I was a little worried. I must be in a funk if I have no desire to buy yarn. I decided to visit Barnes & Noble on the way back home thinking that a visit to the knitting books and a coffee at the Starbucks inside would make me feel better. Well, let me tell you, it did! I knew the planets must have aligned. Of course there wasn't any yarn calling to me at The Fabric Place! I was meant to come to B&N and pick up Knitting Rules! Now if I can just find the Mason-Dixon Knitting book, I will be set. An odd thing has happened to me recently. 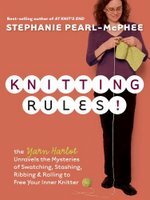 I can only read books about knitting and knitting patterns. I am trying to finish Stiff: The Curious Lives of Cadavers, which is really interesting and cool, but I can't seem to get through it. The author nor any of her interviewees knit. It has lost its appeal. Also, I saw a girl wearing a Harry Potter-like scarf. I say Harry Potter-like, because even though she used the right colors and even got points for knitting it herself, she used chunky wool and did the whole thing in garter stitch. This is a sign. Once I finish the green lacey slanty scarf, I am going to finish my Harry Potter scarf. I might not be able to wear for a few months, but I will be able to rest assured knowing that it is complete and it will be ready for the winter and the next Harry Potter book.